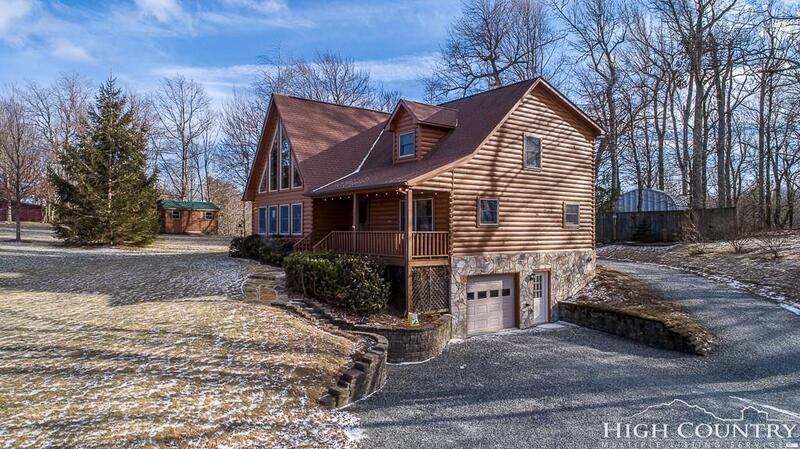 Fantastic Log Home in Boone with Easy Access, Easy Driveway, and Level, very usable Yard Areas. The home features 3 Bedrooms, 2 1/2 Baths, a 10 X 16 Open LOFT overlooking the Great Room, desirable Great Room volume with Stone Fireplace, a discreetly located Half Bath off hallway, a Huge 21 X 22 Master Suite with walk-in closet AND Built-In Storage, Huge walk-in Laundry Room, a 16 X 9 finished Den, a Spacious @ approximate 30 X 12 Family Room, Covered Front Porch, Foyer Entrance, Wide Open Decking directly off Dining / Kitchen, Beautiful Kitchen with lots of pretty Cabinetry and hard surface counters, whole house Instant Hot Water Heater and a roomy Workshop Area off the Oversized 1 Car Garage. Conveniently, the homeowner can use the side drive/parking area to bring groceries directly into the Dining/Kitchen area. Believe it or not, Sunrise East Estates views the slopes of Appalachian Ski Mountain and all the way to Grandfather Mountain ! This home shows beautifully and offers lots of finished living spaces and storage. Furniture, decorations and furnishings ARE NOT INCLUDED.